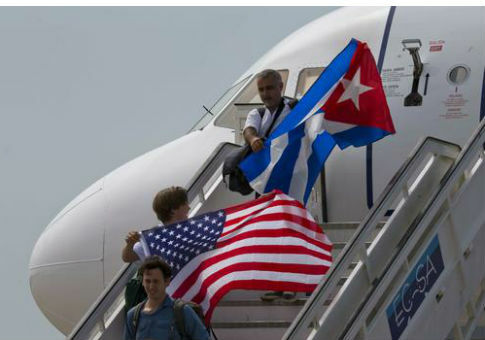 The first commercial passenger flight from the United States to Cuba in more than half a century arrived in the central Cuban city of Santa Clara on Wednesday. The JetBlue aircraft departed from Fort Lauderdale, Florida on Wednesday morning around 9:45 a.m. with 150 passengers aboard. The trip took about an hour, landing at 11:00 a.m., Agence France-Presse reported. "It’s a new day for Cuba travelers and one we have thoughtfully prepared for. We are proud to usher in a new era of Cuba travel with affordable fares and great service," JetBlue’s executive vice president Marty St. George said. President Obama announced in December 2014 the U.S. would normalize relations with its Cold War enemy after five decades of restricted trade and travel spurred by America’s efforts to contain communism. Secretary of State John Kerry pointed out on Twitter that the flight occurred just over a year after he raised the American flag at the U.S. Embassy in Havana. The Obama administration gave the go ahead last month for eight U.S. airlines to begin nonstop daily flights to Cuban airports beginning this fall. The tentative list of airlines included Alaska Air, American, Delta, Frontier, JetBlue, Southwest, Spirit, and United, according to the Department of Transportation. U.S. citizens are barred from visiting the island as tourists, though there are widespread exceptions, including educational travel and family visits. The U.S. restarted commercial sea travel between the two nations in May after a Carnival cruise ship traveled from Miami to Havana. This entry was posted in National Security and tagged Barack Obama, Cuba, John Kerry, Raul Castro. Bookmark the permalink.